Girls enjoy getting together to share stories, food and fun. That’s true whether the girls are 15 or 90 years old. Or — in Westport — whether they’re 15 and 90. Carolyn Malkin is midway between those ages. As a volunteer meal-deliverer for the Senior Center, she realized a lot of women live alone. They’re interesting, chatty and filled with amazing histories — but they didn’t always have a chance for social interaction. Carolyn had a great relationship with her own grandmother, who lived to 99. But — as the mother of 2 girls — she knew a lot of teenagers in Westport don’t have grandmas nearby. 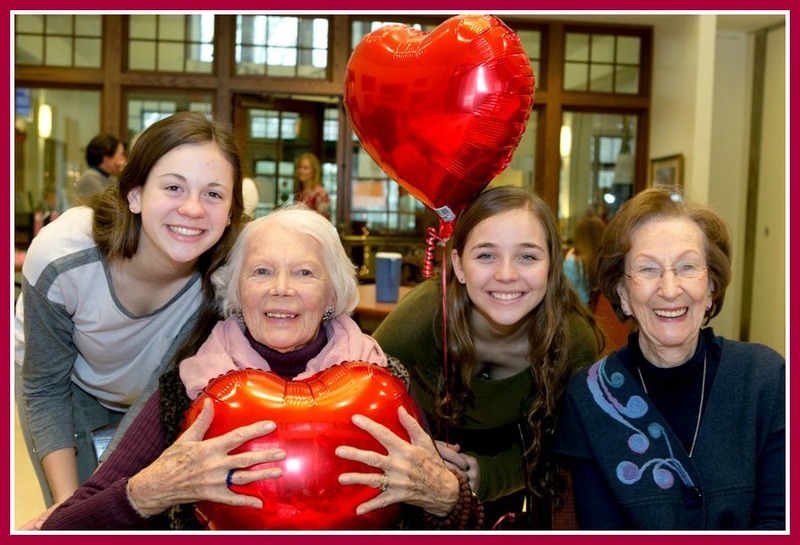 Working with the Senior Center’s Sue Pfister; Human Services’ Barbara Butler and Sue Lebrija; Staples High School administrators John Dodig and Rich Franzis, and “younger seniors” Mary Maynard and Mildred Bunche, Carolyn created the Girlfriends Club. Pairs of high school girls spend an hour or so a week with a “girlfriend”: an older Westporter. 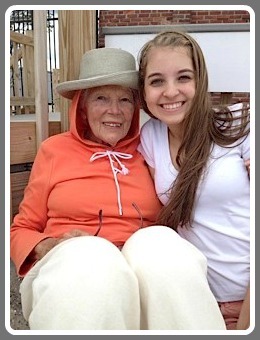 Last year, Carolyn’s senior daughter Melony and a few friends formed the first relationships. This year, Carolyn’s sophomore daughter Sydney recruited her own friends. A couple of dozen more teenagers signed up. It’s unclear who has more fun: they, or their 80- and 9o-something girlfriends. Carolyn goes to the 1st meeting, introducing everyone and helping the conversation along. Very quickly, though, she’s not needed. “Their relationship develops better without me,” she says. Joyce Clarke is the oldest girlfriend. At 103, she didn’t know what she’d talk about. She hadn’t been around young people for a while. Quickly, Carolyn says, she learned they’re interested in the same things she was, years ago. The weekly meetings are fun. So too are get-togethers with the entire club. 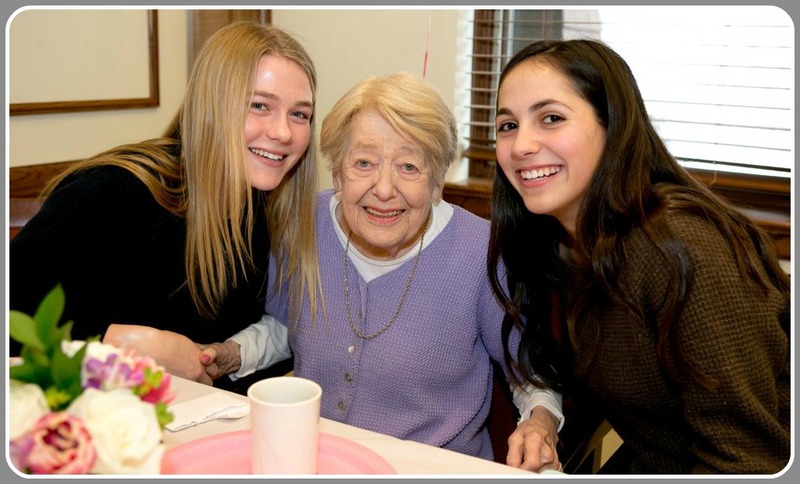 At a Valentine’s party earlier this month, the group gathered at the Senior Center. Nothing was planned, beyond food and decorations. Soon, everyone was talking, laughing — even dancing. One woman and her girlfriends made up a dance. Once Rita joined in, everyone else did too. This entry was posted in Organizations, People, Staples HS, Teenagers and tagged Carolyn Malkin, Girlfriends Club, Sue Pfister, Westport Senior Center. Bookmark the permalink. Love it! What a wonderful concept Carolyn! As a young girl I always looked forward to spending time with my Grandmother, Great Grandmother and Great Aunts. I learned so much from them and I LOVED the stories they told me. Part of who I am is because of them and I feel blessed to have had them growing up. Delightful! Kudos to all involved! Someone, check out what is happening regarding seniors in Greenwich, Ct, it is a tow wide project that allows seniors to remain in their own homes. Most intetesting. I would like add that as a daughter and caregiver to one of those older girlfriends how much I appreciate this program. I grew up with my grandmother and my mother was her caregiver and there is so much that can be said about the extended family but as my sister and I both work full time we often feel guilty about how much our mother is alone. Some of it is her own doing. She likes things on her terms and she was a little resistant to this program at first, not knowing what she would have to offer the girls. Now she looks forward to her weekly visits with them with immense enthusiasm, not wanting anything to interfere with it. My sister and I are so pleased knowing that she will have weekly visitors who she enjoys so much. This is a wonderful program, I only wish I had thought of it! Carolyn is brilliant, kind, understanding and works hard to make this all happen. I just hope that the importance of it is fully recognized and that it can continue for many years to come. Thank you to everyone involved. Great story and photos and what a terrific idea! One thing I love about Westport is the opportunity for all generations to interact regularly, and this takes it one step further! Nice to see Dan’s mother. She looks very sharp and lively. Tremendous! Both young and old can learn many things from one another! This looks amazing! Maybe at some point the program could expand to include younger girls who could also benefit – even having school aged girls join the current partnerships! Such a wonderful program – congrats!!! 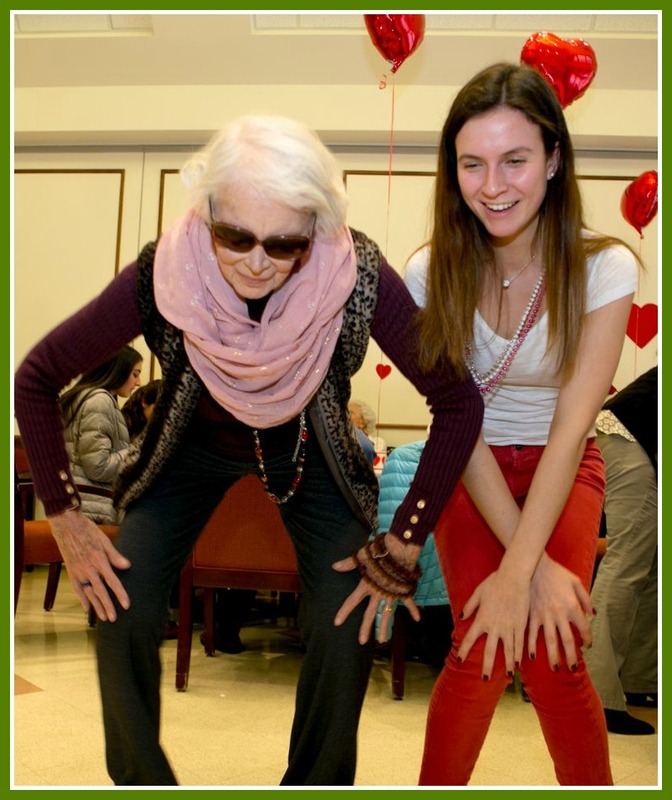 What a great idea…as a senior caregiver I can tell you, they love the interaction. Most nust sit and watch tv alone or sleep. Their kids are off working or don’t live close so to have a younger person to keep their minds active and break up their day is wonderful…kudos to the organizers and especially to the girls for taking time to do a great service! My cousins and I grew up close to my grandparents and often spent weekends with them. I learned to sew, put up jams and jellies, can tomoatoes, knit, needlepoint and so many other things from my grandparents. Sadly, three of my four children (the ones with kids, natch) live in MS, CO and TX and I rarely see them, so they don’t have grandparents to grow up with. I would love it if a program like this were in their towns so all five of my granddaughters could benefit from a girlfriend program. What a beautiful idea! I was fortunate to have both my grandmothers (and grandfathers!) into my 40’s. What I have learned in life from each of them can never be replaced. Though our mom (Jo Woog) was skeptical at first, and gets nervous about how to entertain the girls and what to serve, the time goes all too quickly. I have enjoyed tremendously this program, not only participating in it, but photographing it as well. Kudos to Carolyn Malkin and all those who helped her bring “The Girlfriends Club” to fruition. The best gift for our seniors is spending quality time with them and listening to their stories. 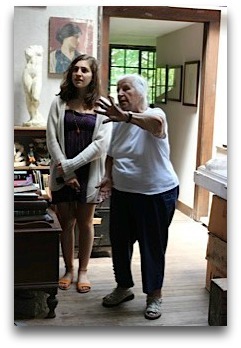 And as for our teens, there is so much to be learned when spending time with grandparents or other seniors. What a wonderful program. Wouldn’t it be neat if this program was expanded somehow and incorporated into the Downtown Planning process? The generational continuity for a lot of families would seem, perhaps, even more important than having another playground downtown. Allowing and encouraging our Westport seniors to be able to age in place knowing that there is an effort to accommodate them could be a huge advantage to a lot of families. And to Westport’s credit. What a good idea. So nice for both sides of the equation. Dan, please say hi to your mom from me! It’s stories like this that make me so grateful to be a Westporter. I’m so proud of you girls!!! What a great idea-so uplifting for everyone!! !